Our American Mission Square Coffee Table features classic Spindle sides and a simple bottom shelf reflecting it's true Mission design heritage. This Bench Crafted piece has rour Solid Quartersawn Oak Drawers, Spindled sides and a bottom Shelf ideal for keeping your current book, Kindle or IPad. 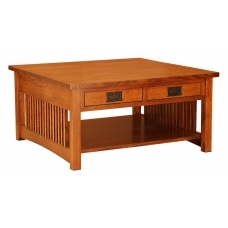 Has many other Living Room items to build that perfect Living Room group .Made in the USA! !